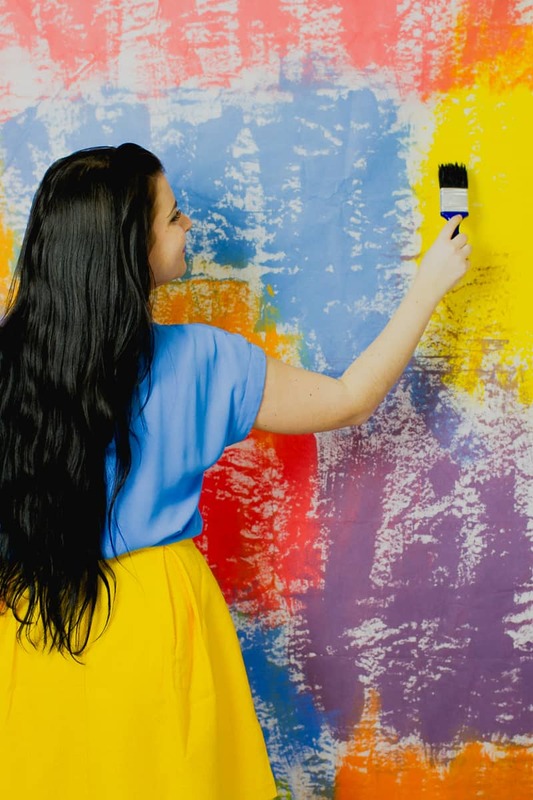 What better way to add a bit of colour to your wedding than with a bold and colourful backdrop! If you think you’re not the DIY type then I think I might be about to tempt you into this one because it took about an hour to make, was so easy and cost the a grand total of £20. Not bad huh! We wanted to create a watercolour effect, but using watercolours on such a large area would have taken days! We know our brides need to be time savvy so we used simple old poster paint, which I think looked just as good and meant we could make it a little rough around the edges creating a cool & edgy effect. Step 1: This really is as simple as painting your sheet with the different colours, in different directions and making different shapes until the entire sheet is covered. Don’t worry about filling in any white gaps or having paint colours run into one another, as this gives the backdrop that watercolour effect. Step 2: Leave to air dry! If you are struggling to find paper large enough in your local craft store, take a look on Ebay for cheap photography backgrounds we found loads for between £5 – £10. You can see our backdrop here in action. To me this is definitely a DIY that screams ‘Go Bold or Go Home!’. Go on, give it a try!